It has been days and I cannot stop thinking about Blue Valentine. The performances by Michelle Williams and Ryan Gosling are so raw, powerful, and gut-wrenchingly emotional that they make any other depictions of marriage look like a total sham. Williams and Gosling are Cindy and Dean, a couple living in rural Pennsylvania with their young daughter. Their marriage has reached its breaking point and it is Frankie who holds them together. Cindy feels stuck in her life, having given up on her med school aspirations. Dean paints houses for a living and drinks all day, wasting away any potential. In an attempt to save their marriage, he takes his wife to a motel that only exacerbates the inevitable dissolution of their marriage. The film jumps between these moments of profound sadness, frustration, and arguments and flashes of the couple’s happier days when they were blissfully in love and beginning a heartfelt romance. 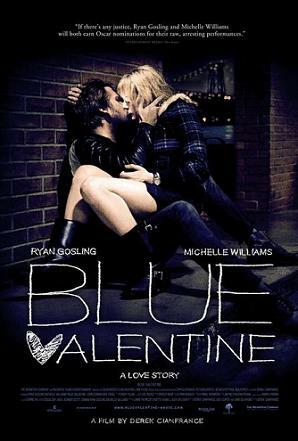 Blue Valentine captures the fleeting moments that make life so precious. Those happier days are met with sweet moments. Dean serenading Cindy with a ukulele – the song that accompanies the film’s simple yet lovely trailer – especially stands out. These scenes are filled with light and brightness, much like the character’s hopes for the future. The present-day scenes are darker, more claustrophobic as the realities they have become trapped by – parenthood, dead end jobs – have strained the relationship. You begin to feel just as trapped and at a loss as Cindy and Dean. The flashbacks fit effortlessly with the present-day narrative, a testament to the sharp directing, writing, cinematography, and editing led by director Derek Cianfrance who co-wrote the script with Cami Delavigne and Joey Curtis. These elements become emotionally real because of Gosling’s and William’s vulnerable and poignant performances. Poignantly, no true conclusions are reached. Cindy and Dean’s divorce seems imminent but Blue Valentine does not preach anything about marriage or divorce. The characters are just as they are. First they are young and perhaps naïve and then they become older, more self-aware. At the end of it all you have wonder, did they know each other at all or were they just clinging to idealized dreams of romance and marriage? Gosling and Williams are nominated for Golden Globes for their performances. In an ideal world, they will win. In a more perfect world, they will receive Oscars nominations. Few films this year have shaken me up emotionally as this film. One of 2010’s best to be sure.